One of my goals in taking a sabbatical from developing products at IBM was to learn and discover new ways of doing things, including new tools and services. Despite being an incredibly large company with more than 400,000 employees, IBM has done a good job keeping up with modern tools. For example, when we were acquired into IBM over five years ago, I was impressed that every employee was assigned not only an email address, but also a mandatory instant messaging account. At the time, this was quite a revelation: I could go into work, see who anyone else in the entire company was online, and have a chat with them. 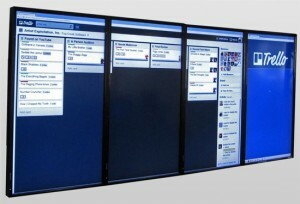 For real-time collaboration, particularly with global teams at IBM, this was amazing. One tool outside of IBM and Google that I ended up falling in love with was Trello. The product of the always-fantastic Joel Spolsky, Trello is a deceptively simple and wonderfully delightful way of organizing thoughts, ideas, tasks and priorities. It has also integrated collaboration in a first class way, and I can see how using Trello would be a great tool during software development project — even the large ones. I can’t do a better job of describing Trello than Spolsky himself, so I’ll just link to the launch description, here: http://blog.trello.com/launch/. His thoughts on the horizontal nature of Trello, and why that’s important, are also worth reading. I am somewhat embarrassed that Trello has been around for 1.5 years, and I’m only discovering it now. This may be a good example of why I felt it was important to “step outside” for a bit. If I hadn’t heard of Trello, perhaps you haven’t either. It’s worth a peek.